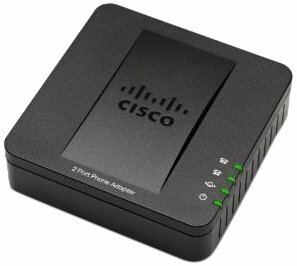 The Cisco SPA122 is an Analog Telephone Adapter (ATA) with 2 FXS, 1 10/100 WAN and 1 10/100 LAN ports. The SPA122 is an intelligent low-density Voice over IP (VoIP) gateway that enables carrier-class residential and business IP Telephony services delivered over broadband or high-speed Internet connections to two standard RJ-11 telephones. The 10/100 LAN port allows internet connectivity to be extended to a second device eliminating the need for a second Ethernet drop. The LED lights indicate the state of each call and react to users actions such as on/off hook and hook flash.